Every year my son’s elementary school has a staff and teacher appreciation week. It sneaks up on me and catches me off-guard (every year!) In the spirit of last minute teacher appreciation gift ideas, I’ll be bringing you a week’s worth of ideas that are quick, easy and affordable! I spotted some glass votive holders at Goodwill (previously purchased at IKEA), and knew I could do something special with them. Then while browsing Lowe’s I found myself staring at the succulent plants. Eureka! I had my gift idea! A “Thank You for Nurturing My Child” Teacher Appreciation gift idea! Start by filling the bottom 1/3 of the votive holder with the decorative rocks. Spoon soil on top of the rocks. Set the plant into the soil and fill in any bare spots with soil. Water the plant until the rocks are underwater, but not the soil. Print out the gift tags (Download my tags for free HERE!) and cut them out. Tie a string of raffia loosely around the plant and attach the tag. Deliver to school with a big thank you and an “I appreciate you” smile! 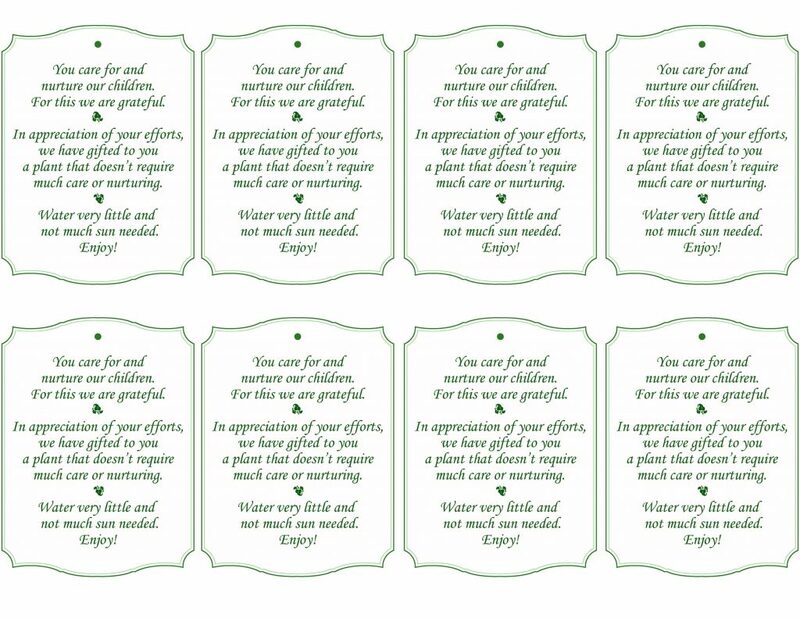 Do tell me, if you were a teacher, would you appreciate this “Thank You for Nurturing My Child” teacher gift idea? Or is this just another tchotchke collecting dust on your desk? Stay tuned for more Teacher Appreciation Gift Ideas this week! If you liked this succulent idea, you’ll love this beach themed succulent garden! And you’ll surely love these 25 Ideas for Tabletop Gardens! I am a teachr and I love plants in my rooms. I would love to get this. I think I will make some for my daughter’s teachers this year! That is bad I spelled teacher wrong in my post – I teach English LOL! I forgive you Corynne. I blame typos on fat finger typing ;-). Teacher gifts, hostess gifts, plants for my own home that maybe I won’t kill … the possibilities are endless. I think several of these would look good lined up down the middle of a dining room table (minus the ribbon and note, of course). Thanks for the inspiration! Nice idea! This could also be useful to other occassions. I love the tag that says your message. I definitely would recommend to one of my friends. Thanks for sharing! Can you tell me what kind of plant you used? Love love your idea…its a wonderful gift. Such a cute idea! As a teacher, I would MUCH prefer this to another apple mug or something similar that is very thoughtful (and very appreciated for the kind gesture!) but wouldn’t get used. Oh, and I think it’s a lovely gift for the school support staff as well (secretaries, custodians, kitchen staff, music/gym teachers, nurses, librarians, special ed teachers and aides, speech pathologists, etc) who don’t often get recognized the way classroom teachers do.